When holidays like the 4th of July and Memorial Day come around, I always plan to include some red, white and blue desserts to get into the spirit. 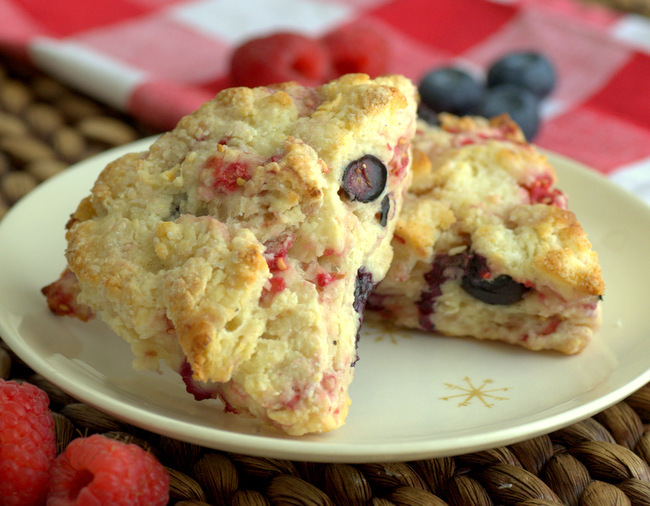 These Red, White and Blue Scones are a brunch option, rather than a dessert one, and they are loaded with raspberries, blueberries and white chocolate chips. The buttermilk scones are very colorful and are bursting with flavors that make them a good choice for any summer occasion, as well as for times when you’re feeling a bit patriotic. 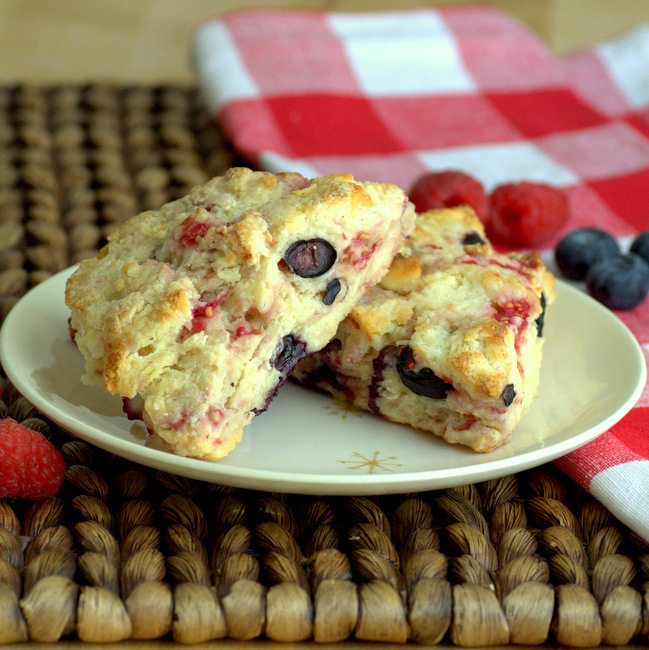 I used a buttermilk scone dough that is not overly sweet to showcase the berries. The dough is relatively dry as it comes together, so don’t be alarmed as you mix it. This is because the berries will release some juice in the oven and the excess liquid will cause the scones to spread out. That said, if the dough is too dry for you to handle easily, add in an additional tablespoon or so of buttermilk. You can always toss a little extra flour down on your work surface if necessary. The white chocolate chips add a touch of vanilla sweetness to the scones, contrasting with the fruit. White chocolate chips can burn if they are on top of the scones during baking (they’re baked at a high temperature), so be sure to tuck them into the scones before baking. Making these scones can get a little bit messy, as it is easy to crush the fresh berries – especially the raspberries – as you shape the dough. Don’t worry if you get a few smears of raspberry on top of your scones, however, as it just adds a little more color to these fruity treats. You can substitute frozen berries, but they should be tossed in a little bit of flour to help ensure that they don’t bleed too much as you incorporate them. Scones made with frozen berries also might spread a little bit more, as the frozen berries tend to release more liquid than fresh during baking. The scones are ready to eat as soon as they come out of the oven and are at their best when they are warm. In a medium bowl, whisk together flour, sugar, baking powder and salt. Cut in butter using your fingertips or a fork until no pieces larger than a pea remain visible. Add in buttermilk and stir until the dough begins to come together and appears shaggy. Add in berries and white chocolate chips and continue to stir gently until the dough comes together into a very rough ball. Gather the dough with your hands and flatten it into a large disc. Cut the disc into 6 even wedges and arrange them on the prepared baking sheet. Bake for 18-22 minutes, or until scones are set and lightly browned around the edges. Transfer to a wire rack to cool before serving. 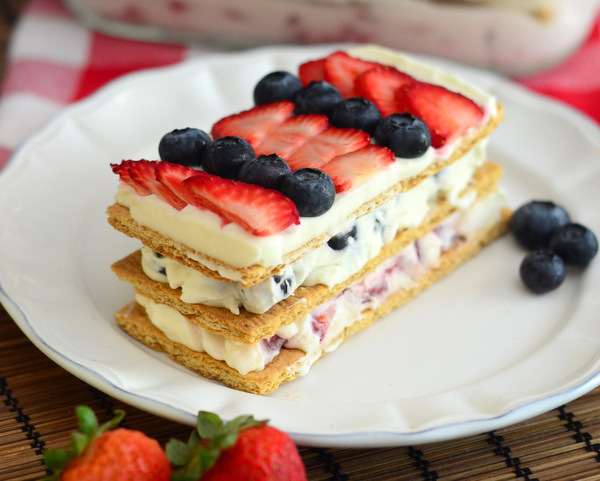 6 Red, White and Blue Berry Desserts for Your 4th of July! 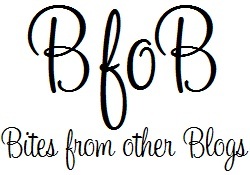 Next PostNext 6 Red, White and Blue Berry Desserts for Your 4th of July!